Drafting chairs are an essential aspect of comfort during the creative process. Used by architects, engineers, and artists alike, these chairs provide the ergonomic support your body's needs throughout the day and contribute to a more productive work environment. The Zenith drafting chair is versatile, allowing for adjustments in almost every area of the seat, so it’s easy to set your own custom personal preference. The height of the chair is adjustable from 23” to 33”, while the padded arm rests are width and height adjustable with 7 locking positions. This chair also features an adjustable seat pitch, and the back rest is adjustable as well in height, depth, and tilt angle. In addition, the 18” chrome foot ring is height adjustable. 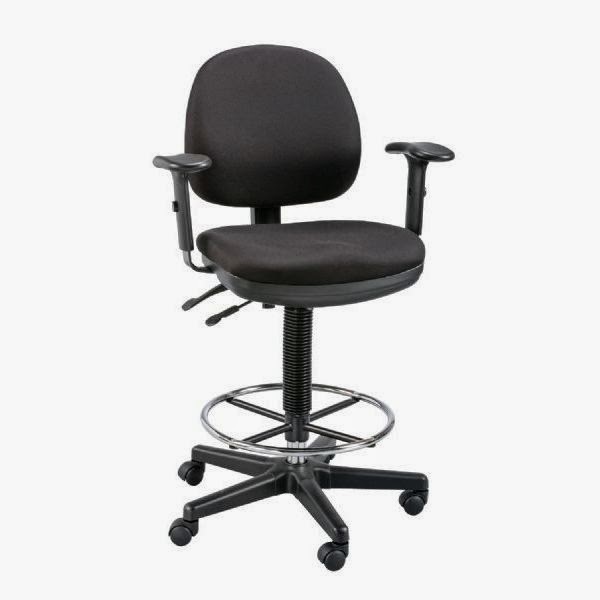 The base of the chair is 26” diameter steel reinforced nylon for durability and stability, and comes equipped with 5 dual-wheel casters that allow for simple mobility. The seat and back cushions on the chair are constructed with ergonomically contoured foam that support your body, and also feature polypropylene back shells. The seat cushion is a waterfall design that promotes circulation and is 3½" thick x 19"w x 18"d, while the back cushion is 3" thick x 17"w x 16"h.
This chair not only provides you with comfort and support during long hours, but has a sturdy and stylish design that compliments any work space. Try the Zenith drafting chair, and feel the difference.